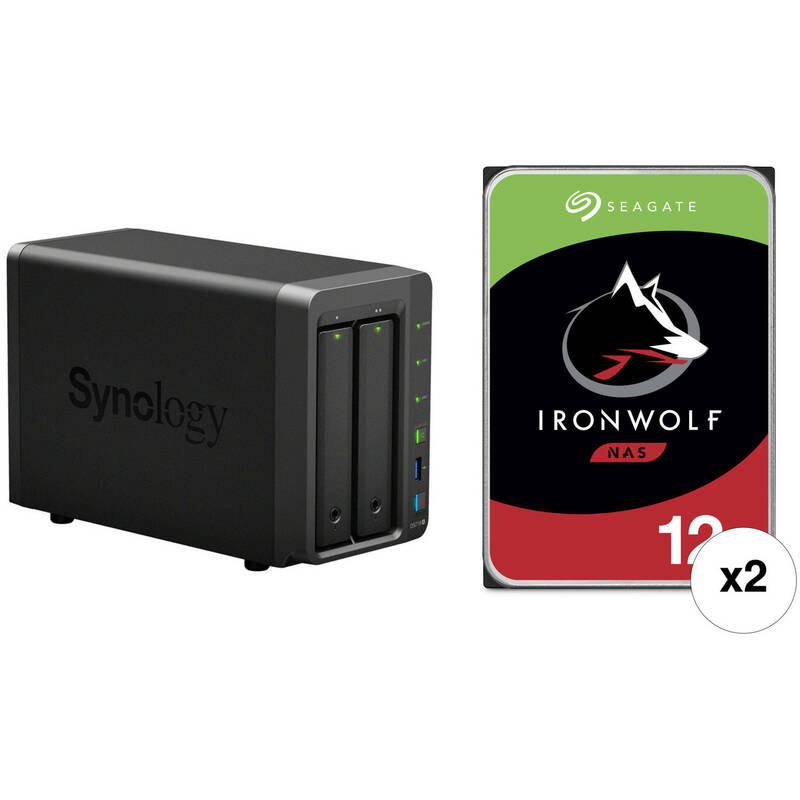 This B&H Kit combines the Synology DiskStation DS718+ 2-Bay NAS Enclosure with two Seagate 12TB IronWolf 7200 rpm SATA III 3.5" hard drives for a total storage capacity of 24TB. Built with a quad-core processor, an AES-NI hardware encryption engine, Btrfs file system support, and real-time 1080p/Cinema 4K video transcoding, the DiskStation DS718+ 2-Bay NAS Enclosure from Synology is designed for those who need a high-performance NAS that has been optimized for not only intensive workloads, centralizing data backups, and storing UHD media content, but also to safeguard data and deliver fast file transfer speeds It is equipped with two drive bays that are capable of natively supporting 3.5" SATA hard drives, as well as 2.5" SATA hard drives and SSDs. Using its two drive bays, this NAS will allow you to store and share many files, including videos, music, photos, and documents with up to 2048 user accounts and 500 maximum concurrent connections. The DS718+ runs on Synology DiskStation Manager (DSM) OS, which is a browser-based operating system which helps to simplify managing your Synology NAS. Its CPU is a 1.5 GHz Intel Celeron J3455 Quad-Core with a burst frequency of up to 2.3 GHz, and its 2GB of DDR3L RAM, which be upgraded to 6GB, allows frequently-used files and applications to be quickly accessed. The NAS can achieve encrypted read speeds of up to 226 MB/s and encrypted write speeds of up to 184 MB/s, while a dedicated hardware transcoding engine can transcode two-channel H.264 (AVC), H.265 (HEVC), MPEG-2, and VC-1 video at resolutions up to 4096 x 2160 at up to 30 fps via Video Station and DS video. This allows 4K videos to be converted and played on-the-fly on devices that do not natively support Ultra HD formats. Also featured are three USB 3.0 Type-A ports and eSATA port which allow it to be connected to your Windows or Mac system, and network connectivity is achieved via the dual Gigabit Ethernet ports that support Link Aggregation and Failover, allowing your stored data to be shared with users throughout the network. Data may also be made remotely available through the free iOS and Android applications. For those who require RAID support, the DS718+ supports RAID 0 and 1, as well Synology Hybrid RAID and Basic RAID, each of which offers performance, data redundancy, or a combination of both. For those who do not require a RAID, JBOD is also available, allowing each drive bay to be individually utilized. Additionally, once connected to a DX517 expansion unit, RAID 5, 6, and 10 are also supported. The DS718+ is engineered to be energy efficient. Not only does it offer a 92 x 92mm fan to help keep the system running cool at all times, its noise dampening design of 18.4 dB(A) makes for quiet operations. The server supports numerous scheduled power on/off cycles and hard drive hibernation to further minimize power consumption and operation expenses. The Synology DiskStation DS718+ 2-Bay NAS Enclosure operates on 100-240 VAC at 50/60 Hz and includes an accessory pack, a 65W AC power adapter, a power cord, and two RJ45 LAN cables. It is protected by a limited 3-year warranty. The Synology DS718+ comes with a 1.5 GHz Intel Celeron J3455 Quad-Core (64-bit) processor with a burst speed of up to 2.3 GHz and 2GB of DDR3L RAM, delivering encrypted read speeds of up to 226 MB/s, encrypted write speeds of up to 184 MB/s, AES-NI hardware encryption, and 4K H.264/H.265 video transcoding. Provides comprehensive quota control on user accounts and shared folders. Makes data recovery fast and flexible. Detects and recovers corrupted files without user intervention. File Station is a web-based, fast and secure management tool built to allow easy, drag-and-drop operation without requiring any complex setup on Windows or Mac. Advanced search and filtering tools allow for easy organization and sharing of files with just a link. It supports SMB, FTP, AFP, NFS, and WebDAV, and is compatible with most environments. Access and stream your 4K media content virtually anytime and anywhere. The DS718+ supports 4K H.264/H.265 online transcoding via Video Station and DS video, allowing 4K videos to be converted and played on-the-fly on other computers, smartphones, and media players that don't natively support Ultra HD formats. Save additional investments by integrating various network services, web/mail services, and management applications into your NAS. Box Dimensions (LxWxH) 11.181 x 10.472 x 4.882"